Apparently Anderlecht will switch from adidas to Joma next season. The way adidas act they'll keep losing such teams! Anderlecht’s own press release mentioned a relationship lasting “more than 30 years”, but obviously their focus was on the new beginnings with Joma. 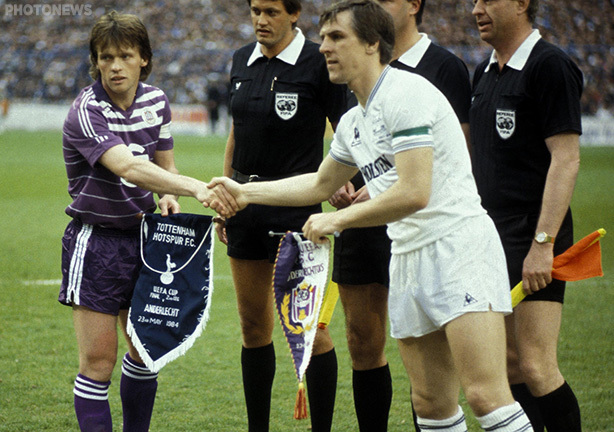 The club definitely had the three stripes as far back as 1984 (incidentally, it’s a further sign of the world’s decline that a Google Image search for ‘Anderlecht Spurs’ first brings up five pictures from he 2015-16 Europa League rather than the ’84 final), and probably even further back. The link was strong, but as the initial tweet pointed out, it’s becoming quite common with adidas – Milan and Marseille both switched to Puma in the summer while Dynamo Kiev now wear New Balance. Given that it is such a big change, we will mark with a number of articles – not necessarily in chronological order but just looking at elements of the partnership which we have found interesting. The first time we became of Anderlecht and their adidas-ness was in 1992-93, when there was a poster – we can’t remember who was portrayed – in Shoot!, in the classic adidas Equipment double-shoulder stripes. We would have said that they were in the first Champions League in 1992-93, but that’s clearly a trick of the mind – the kit in the poster wouldn’t have included the massive Generale Bank logo if that was the case and of course it was Club Brugge who were the Belgian representatives, in the same group as Rangers. It’s likelier that the picture was taken in their Uefa Cup win over Hibernian. Anderlecht were somewhat late to the Equipment party, having still had the two-bar sleeve design in 1991-92. However, they made up for that with kit changes in each of the next two seasons, each time incorporating adidas’ brash branding. Edit: See the comment below by Jon, indicating that this kit was first seen in 1991-92. 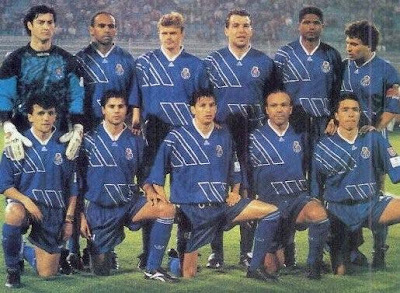 In 1993-94, they were back in the Champions League, though as shirt sponsorship was still not allowed, their tops did look rather bare without the big ‘G’ logo and the gap in the striping. It was the same style as the Arsenal away of the time, but the lower set of stripes were further down and further to the right, so that the left-most bottom stripe matched up with the right-most one on top. For 1994-95, they were in the style used by so many countries at the USA World Cup, while purple sleeves were added and sponsorship was allowed. Unfortunately for them, they went without a win in their six games. Again, their purple away kit saw some usage but, on this occasion, it wasn’t a reversal. It’s something we will look at another part of this series. No-one’s going to forget that game in Bremen in a hurry. But I’m going to forget Anderlecht aren’t in Adidas, through sheer habit, and it’ll be a horrible realisation when I next see them on’t telly. The common factors (other than losing one of those finals to Germans … in Amsterdam) were Rensenbrink, Haan and the three stripes. I seemed to recall Anderlecht changing to the “Equipment” range part way through the 91/92 season – the Belgian league was often featured in the roundup on Eurosport’s “Eurogoals” show and couldn’t help but notice Anderlecht wearing an updated strip (as illustrated for 92/93) from around the turn of the year. Cheers Jon, great spot! Given that that style didn’t come to prominence at Euro 92 and then in 92-93, I wonder were Anderlecht the first side to use it?